Warming Up! 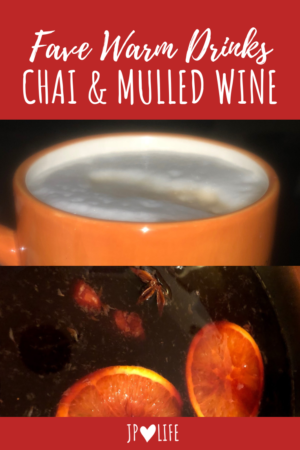 Family Chai Recipe & My Evolving Mulled Wine Recipe - JP loves LIFE! When I think of those rare snow days we had as kids, I almost always have a cup of hot chocolate at some point in my hands, warming my tummy. I still love hot cocoa (had an amazing one at the chocolate museum in Cologne, Germany in November). Now though, I have to confess, I’m more likely to warm myself with chai or mulled wine (I am focused on cold weather survival right now). 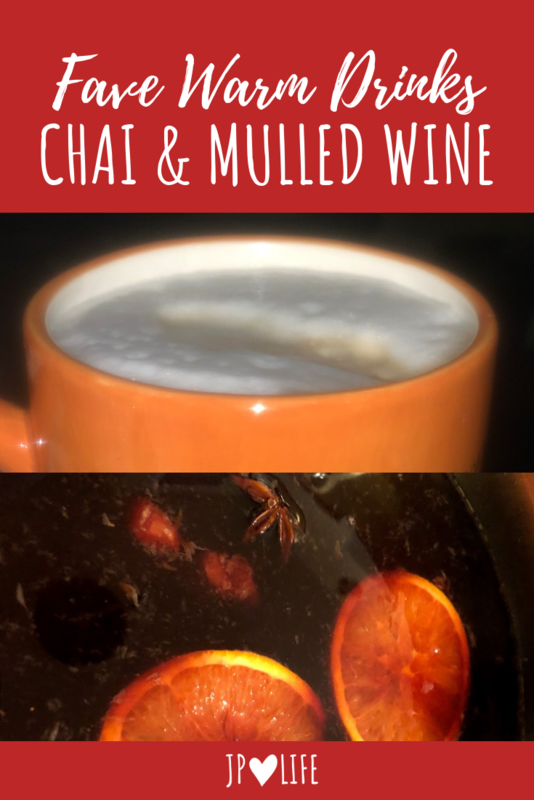 Having fixed both recently and seeing how brutal the weather is, I thought this sounds like a perfect time to share my family’s chai recipe and my evolving mulled wine recipe. My sister-in-law Elizabeth has shared a chai recipe with our family for several years. Previously, I would just buy Tazo Chai Concentrate (which admittedly I still do when I may just want a quick cup here or there). This recipe is part of our family’s Thanksgiving camp weekend traditions along with things like human foosball and human hungry, hungry hippos. She makes huge pots full and we drink it all weekend depending on the temperatures. Put cloves and seeds in a cloth or tea ball and put throw all in pot with water and heat to strong rolling boil. Simmer on low for at least 40 mins. Elizabeth often lets it go longer as it should be really dark it’s a tea concentrate. Add whole milk (at least 2:1 ration of tea to milk). Warm and add honey or sugar to taste. There is a lot of personal preference in sweet vs spicy and the recipe is very forgiving so we taste along the way to adjust whatever seems right at the time. As I have said in posts about going to Christmas markets in Germany and Budapest, Hungary, I really love mulled wine! I think gettnig to taste wines from so many different vendors has really made me open to a range of choices as I make it at home. 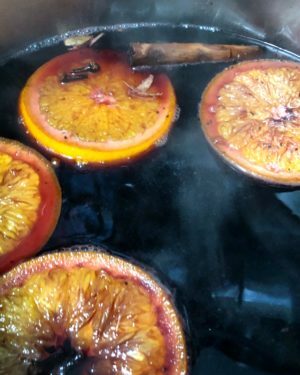 I use the mulled wine recipe that Gimme Some Oven has and work from there after having read LOTS of recipes, here’s what I have been doing this winter. I simply mix in my stock pot on the stove. You want to warm this up good but be careful it doesn’t boil. You’ll want to enjoy the alcohol in the wine! Let the wine simmer for 15-20 minutes minimum but you can have it go longer as long as the heat isn’t too high. One it is warm, taste & drop in some orange slices. The longer it cooks, the more you may get from some of the spices but 15 minutes of warming should release most of the flavors. Then add honey to taste. Use care not to serve cloves, etc unless you mention the presence to guests. You can add a range of liquors as well and that’s frequently how it is done in Europe, Just add brandy, vodka or rum as you serve so guests get the profile they prefer! To make it pretty, add additional fruit slices, berries, etc. What are your favorite warm drinks? So interesting that you posted this. I just had the most delicious chai latte from a family shop in Peoria. 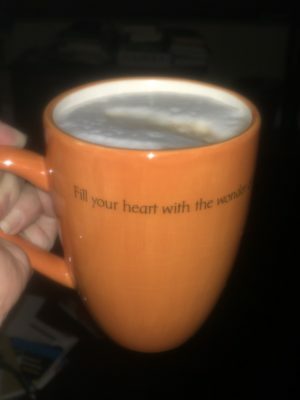 I thought about googling for a quick way to make this favorite hot drink and here you are! Love how timely that is! And we will definitely have some hot chocolatw when we go the chocolate museum this summer.